Located in the heart of Fenway, Jerry Remy’s is your quintessential sports bar and grill, with a menu full of standard “sports bar” fare..ie. burgers, sandwiches, and fries. So, when my cross fit box, CF Southie, was invited to try out a sampling of some of their paleo-friendly options, I was psyched! A lot of restaurants are beginning to “up” their game with gluten free, vegan, and vegetarian options and Jerry Remy’s certainly isn’t falling behind. We had the chance to sit down with General Manager Don Bailey while he informed us of his new menu, the purpose being to offer athletes healthy fare while dining out! Come- on, just because they train hard does not mean they eat junk or want to eat junk all of the time! As a CF athlete my diet is one of my #1 priorities during training and I appreciate places like Jerry Remy’s making an effort to combine the fun aspect of a sports bar with healthy, delicious food. His servers then graciously began serving us some of the soon to be menu options. Of course, with any great manager and chef, the opinions of the consumers must first be considered. Is this stuff athletes and cross fitters would really eat? 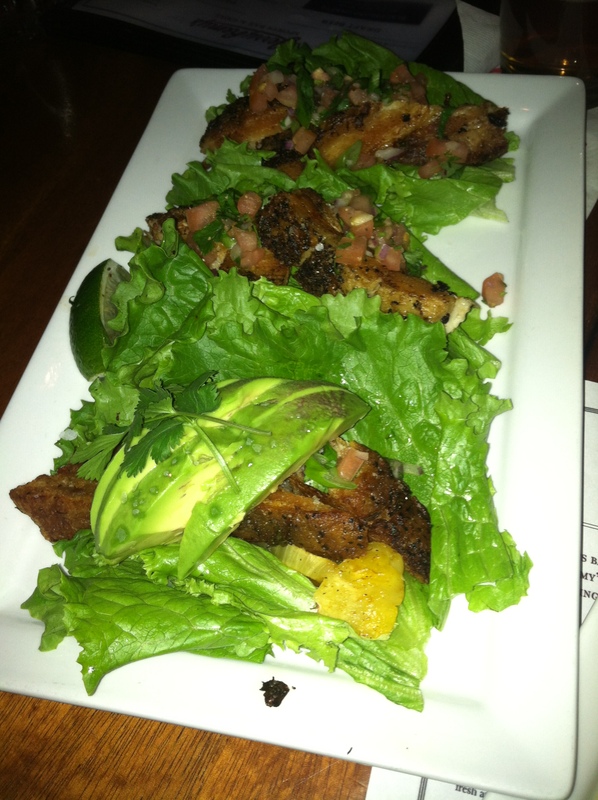 We started out with the Paleo options first, which included a grilled chimmichuri steak served over a healthy bed of grilled vegetables, honey roasted pork belly tacos wrapped in lettuce leaves, and herb seared atlantic salmon finished with a balsamic glaze and again over grilled veggies. 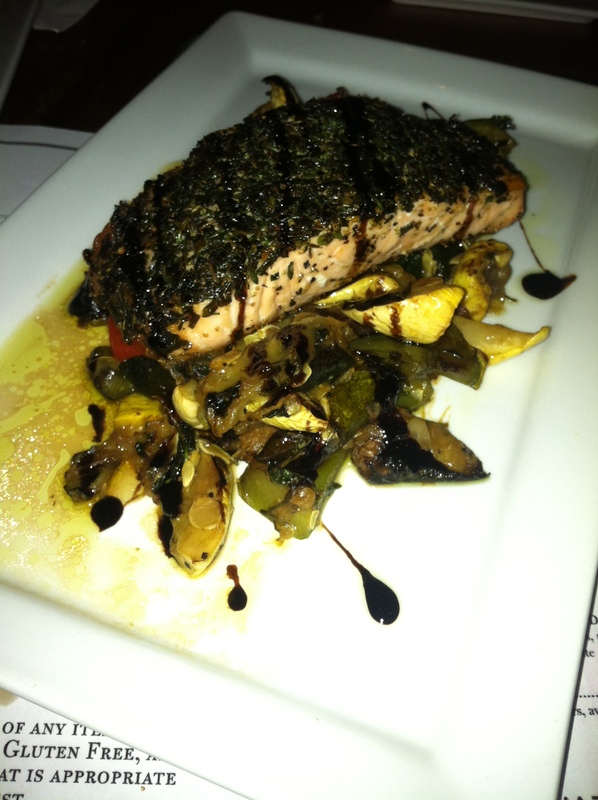 The salmon was impeccable! I don’t know what seasoning they used for the grilled vegetables but it was delicious! The steak was also cooked to perfection, and the tacos could have used just a tad more seasoning or sauce! For those looking to get their vegetarian on, we were then served the grilled tempeh burger with arugula, soy mozzarella, and fresh avocado. Probably one of my favorite sandwiches of the night. Oh! And did I mention it was served on a Gluten-free bun? I don’t eat Paleo 100% of the time so this would be a nice option to have if I was in the mood for healthy bar food. 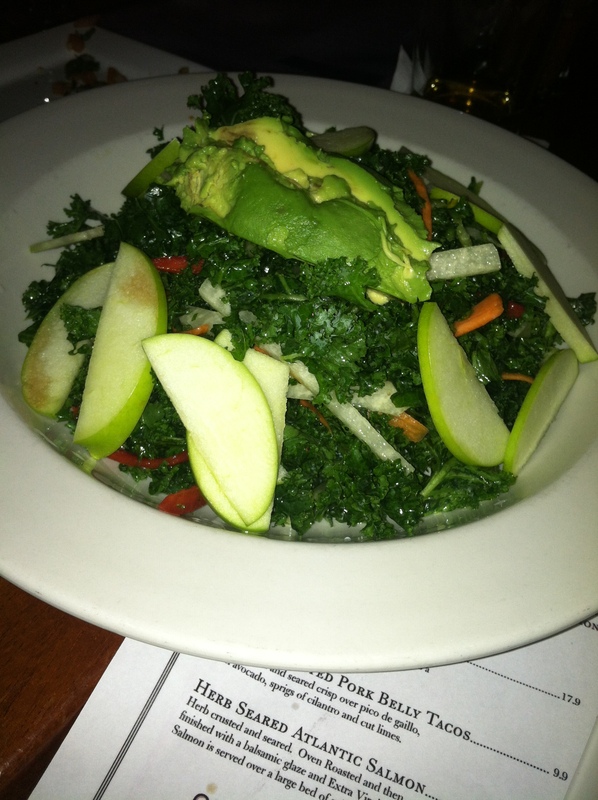 Next came the Kale and Crisp Apple salad, a vegan option. Unfortunately, this was me least favorite dish of the night. It was super bland and could have definitely used some seasoning and maybe even some pine nuts for a tasty addition. Oh well- this was the point of this dinner! To provide feedback and make some changes before rolling out the menu to the rest of the public. Our last dish was a cashew avocado sandwich that was also just incredible. The flavors blended so well together and I had to apologize to the rest of the table for not sharing! Lastly, what meal would be complete without a little booze? Us cross fitters like to drink too ya know! We were served FIVE drinks to round out the night. FIVE!. We were first served two varieties of blood mary, one with a celery salt rim (yummy) and the other with a chili flake rim (holy hotness!). 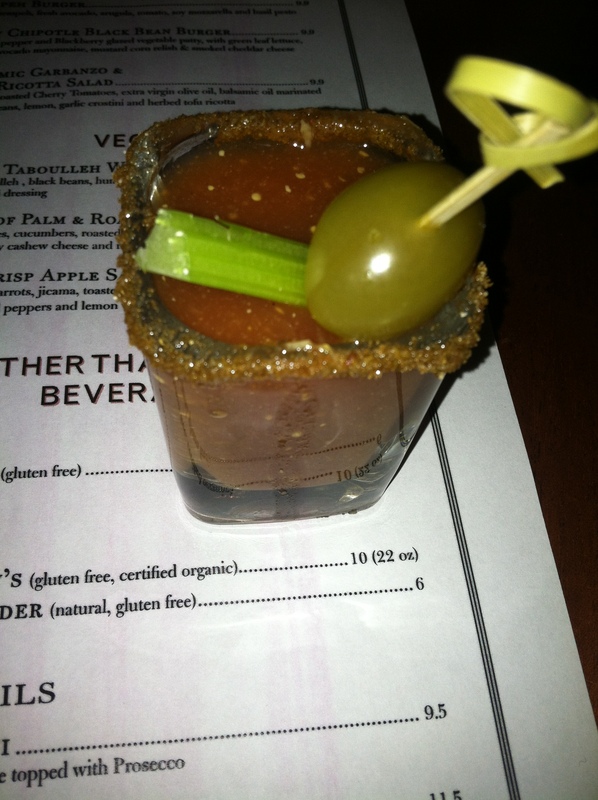 I am not a bloody mary fan and these set my mouth on fire. What was cool about them though was there unique names: Bloody Grace and Bloody Fran (name after cross fit workouts)…hehehe. Then came the Paleo Bellini (peach puree and Prosecco). I could have had about 3 more of these it was that good. The peach puree was such a nice touch and really added some smoothness to the drink. Next came the “Stairclimber Margherita,” a Paleo-guru’s fave. Tequila and lime, that’s all we need! A little too alcoholic for my liking but nonetheless pretty darn good! And finally, my favorite drink of the night! The “Not-A-Colata.” White rum, coconut water, and coconut milk round this drink out, making for a dessert-like experience. I am already dreaming of when I will consume this drink again. Anyways, all in all, we had such a great time an Don and is staff were so gracious to us. We walked away having had a wonderful experience and will definitely be back! It was nice being able to dine out at a place where we could order a few things without any modifications needing to be made. That was a real treat!